Hey friends, its Katie here with lots of business to take care of. First of all, we'd like to thank all of you who commented and shared ideas about Lori's new Card Kit endeavor. I've said this over and over again, but Lori truly hears what you have to say when it comes to stamps and product. Can you believe it? It always seems like its rare that #1 wins, but that is the case today. Shelly Cameron is our winner of Clear Dollar Stamps first card kit! Shelly, please e-mail mypaperhaven@gmail.com with your mailing address. Now for the FREEBIE! Lori has been coming up with some fabulous downloadable backgrounds for you and today I've got another one to share with you. Today's is a woodgrain design which if I recall was a specific request from last time around and just in time to create some fabulous "manly" cards for the Dads in your life. And now to show you some of the ways you can use this background. Here is a photo of the background printed on a piece of Mud Pie Cardstock. This background will print in brown and if you don't have a color printer it will print black. Below is a better representation of the cardstock color... One option is to dry emboss your cardstock after you've printed the background. This adds even more texture to the piece. As you can see, I used the Distressed Stripes folder. Feel fee to ink away too. How about using the VersaMarker embossing pen? I was a bit heavy handed with the marker, but you can see that it creates another look to this background. I used clear embossing powder. How about creating your own wood flooring with another embossing technique... same Versamarker pen, but with gold embossing powder this time. I can totally envision this background with Wendy's stamp set Pirate Ahoy! Here are a couple of Father's Day inspired cards that I created using this fabulous FREEBIE. I grabbed Old Wagon, stamped it with VersaMark ink and used clear powder to create my image. I then took some craft paint and smeared it over the image and then took a tissue and blotted it away. The tissue left bits while I was dabbing, but I loved this look. If you notice, I also used Worn Parchment to print my background on too. Sentiment came from one of the newer releases called Gone Fishin'. And my next card was created with the embossed background and features one of my all time favorite sets called Scenic Trees. #1 Dad is from another new release by Wendy called Backyard Barbeque. I paired some Tim Holtz distress ink with some Mossy Woods textured cardstock. Thanks for visiting today and don't forget we've got our newest challenge going as well as a chance for a guest design team spot. Its all below, so just keep on swimming... er scrolling! Hi everyone! The birthday celebration is over, but we aren't quite done yet. If you weren't aware, Clear Dollar Stamps used to host a great color challenge over at Papercraft Planet, but we decided to change things up to keep things fresh and fun for YOU. Before I get into the details of our new challenge, click -->HERE<-- to see the last of the winners for Lori's birthday celebration. Double check, because there are a total of 25 winners! This week's challenge is called "Give me 5"
This challenge is about fun and easy so all you need to do is focus on the number 5. Is it 5 colors, 5 embellishments, even the number 5, or sets of 5. Its up to you! Now to get your you inspired, I have these cards to share with you from members of the Clear Dollar Design Team. Just use the Mr. Linky to enter this challenge. Please use your direct link to your card/project. If you end up doing more than one card/project feel free to link up each time. Thanks for coming to visit and I hope you have time to join in on the fun. Hi everyone! Thanks for helping Lori celebrate yesterday. Click HERE to see if you are one of the lucky 5 from yesterday's random draw. Details are posted with the winner's list. Don't worry though, we've got 5 new questions/searches for you which also means that we will also have another 5 winners for today! Before I give you the clues though, I've got a little project to share with you that uses that special Birthday Celebration Stamp Set. You've got 4 more days to get it at its special price of $11.99. My mother sent my boys a super cute treat holder and in turn I thought it would be perfect for little birthday favors. I did "borrow" the Halloween treat though. I of course took it apart and measured and this would be very easy to adapt for any treat you had on hand. You will need a piece of cardstock measuring 8 5/8" x 3". Score at 1" and 5"
Fold and decorate. I used a 2" square piece of white cardstock for my cupcake stamp and used a 2 1/4" square piece for the purple mat. Cupcake part is a solid stamp and the cupcake liner was stamped with Memento Tuxedo Black ink and colored with Copics. You will want to staple the bottom flap. If you want to staple your treat with the flap at the same time you can, but I opted to to just use double sided tape to keep it tacked down. The staples will be covered with your sentiment. White piece measures 3/4" x 2 3/4" and the purple mat measures 7/8" x 2 7/8". Flip top flap inside the shorter flap on bottom. So there you go. Take advantage of this great stamp set! 1. How many pages of Flower Stamps are available? 2. In what year did Lori McCroskey start stamping? Hint*** click on the About Us tab to get started. 3. What type of Copic Markers can you find at Clear Dollar Stamps? 4. What are the Wheel Products that you can find at Clear Dollar Stamps? 5. Who manufactures the Stickles? 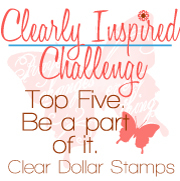 Click --> HERE <-- Click to get you to the Clear Dollar Stamps Store. Thanks for celebrating with us and have a great day! Hi everyone! Thanks for being so patient! I just want to say for Lori and the Clear Dollar Team that we appreciated all your participation and kind comments to the festivities for the Re-Grand Opening of of the website. I have to say that for myself, I think it is definitely the sweetest place to be! Debby, please e-mail me (Katie) at mypaperhaven@gmail.com with your mailing address. Thanks to everyone that played along with us! Hi everyone! Lori and the Clear Dollar Stamps Team hope you had a great time playing along with us in celebration of the the new webstore. Yes, there was a hiccup, but everything is up and running smoothly, so if you didn't get to visit over the weekend make sure set some time aside to satisfy your sweet tooth. Remember, even though all the Everyday Jar-gon giveaways are accounted for, you still have a chance to win the GRAND PRIZE which is the entire set of new release stamps for September. Feel free to borrow the Charlie Blog Hop Badge on the side bar and proudly display it on your blog. Don't worry though, the Everyday Jar-gone stamp can still be yours at 30% off the retail value. While you are visiting make sure to check out all the other sweet deals at the store. So without further ado, the winner is Sue C.
The jar set is absolutely adorable. That is the first thing on shopping list to get. Since I love making cards & papercrafts, I love seeing all the projects the team completes with the stamped images. I would love to see more altered items as sneak peeks such as post-it note holders, party favors, mini teachers gifts, etc. Sue, please e-mail me (Katie) at mypaperhaven@gmail.com with your full name and mailing address. To all winners, remember that I'll be compiling a list of all the winners and then forwarding that list to Lori so she can ship out all goodies at once, so please be patient. Click HERE for an official list of all winners. "I like the Blown Away set. I have some great ideas running thru my mind to put to cards." Thanks everyone! Come back tomorrow for another little tutorial.